Should You Stretch Yourself Financially for Your Dream Home? Are you feeling the pressure of this real estate market to offer more for a home just to ‘seal the deal’? If so, you’re just one of many people feeling the heat to raise their price during a bidding war for a great house. We’re finding that you don’t have to stretch your budget—you can get certified instead! Be a Prepared Homebuyer and Become a Churchill Certified Homebuyer. The key is to prepare in advance. 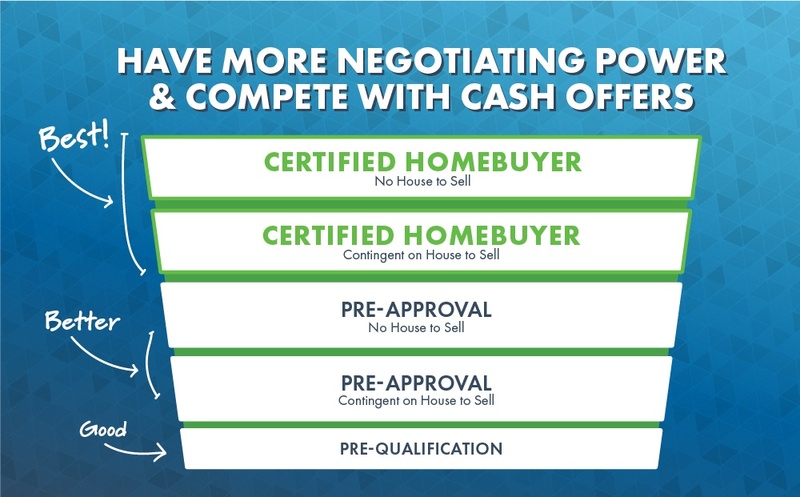 The Churchill Certified Homebuyer program is a game changer and allows you to quickly position yourself as a more reliable buyer which gives you an upper hand during negotiations, and close up to 2-3 weeks faster than the competition. “Our listing agent said the seller had over 20 offers over the weekend—some higher than ours. But they chose us because we were Churchill Certified Homebuyers and could close in 2 weeks. In fact, it turned out to be less than 2 weeks,” said Eulalia N., a recent homebuyer in Texas. A lot of times, what it comes down to is time savings and trustworthiness. That’s powerful for today’s homebuyer. More money isn’t always the answer, a quick closing can often get you the contract. “I put a bid in for a townhouse and was immediately outbid. As I was ready to walk away to begin the search again, the sellers changed their mind and chose my bid. It was the Churchill Certified Homebuyer program that put me over the top. My competition was only pre-qualified and this made the sellers nervous enough to pick my bid,” explained Amy C. of Missouri. Unfortunately, for today’s homebuyer, a standard pre-qualification or pre-approval just isn’t good enough anymore. It’s not worth risking your dream home to a more prepared buyer. Take a look at a breakdown of the different types of offers out there and how they’re being ranked by sellers. With just spending a little more time on the front end, you’ll set yourself up for homebuying success and edge out the competition. "Along with being a Certified Homebuyer and doing all of the leg work upfront, it was my Home Loan Specialist, Tim's personal touch, who convinced the sellers to choose our offer over 3 others. Tim personally called the seller's agent and explained that we were the next best thing to a cash buyer. Upon hearing Tim's input the sellers accepted our offer. Without it, we would not be in our home today! Having purchased 4 other homes with different lenders, this was something I have never experienced from other lenders," explained Sandra S. of Michigan. Match Your Budget with Your Priorities. At Churchill, we recommend spending less than 25% of your total take-home pay on your monthly mortgage payment. With a mortgage you can afford, you’ll have less stress and room in your budget to do the things you love, buy new furniture, or save for a vacation. As a Certified Homebuyer, once you narrow down your list of priorities, you’ll be able to shop more confidently and have the ability to move quicker to put an offer on a home you love and get it accepted. Don’t Stretch to Buy and Regret It. Buying a home is a big (and exciting) decision. But it’s important to get a mortgage you won’t regret. As part of your mortgage plan, Churchill helps you focus on building wealth not getting deeper in debt. It’s important you know the price range you’re comfortable with spending on a new home and stick to it; this way you’ll avoid buying too much house. And if you’ve never owned a home before, it also helps to be aware of the 6 hidden traps in the average mortgage which can make things much worse. If you’re thinking about buying a home, check out our How Much House Can You Afford? mortgage calculator to help you figure out what number works best with your budget.